This lesson is a general overview of moving around in salesforce and becoming acquainted the various setup options. Administrators will learn about the home page, activities, tabs, app menu, and chatter to get you up to speed quickly on learning Salesforce. This lesson teaches administrators how to find information related to licensing and salesforce org limits that are commonly required to know. Administrators will understand the various feature licenses, data limits, user interface options, and social media integration. This lesson teaches administrators how to use licenses, and the best ways to take advantage of queues and the Salesforce licensing structure. Viewers of this lesson will know how to create and deactivate users, select roles and profiles, create queues, grant login access, and understand the fundamentals of activation emails. This lesson will demonstrate the best ways to get help and technical support to have basic questions such as reports or field creation. After watching this lesson, administrators will know how to access Help & Training, contact technical support, find developers on the AppExchange, use Developer Force, and view the Salesforce network system status page. This lesson discusses the setting up of fields and record management which serve as the foundation to Salesforce. Administrators will know how to create and manage records, edit page layouts, create fields, send single and mass emails, manage campaigns, and create email templates. This lesson covers the creation, management and uses of Products in Salesforce for sales team to use to manage their sales pipeline. After viewing, administrators will have a firm grasp on managing products and pricebooks, as well as managing products on opportunities and quotes. This lesson discusses important concepts surrounding lead management and record types most useful for medium-sized organizations with various sales processes. Administrators will become proficient in management lead assignment rules, create web to lead forms, creating auto-response rules, performing mass delete and transfers, creating record types, and adding leads to campaigns. This lesson discusses and explains the benefit of Outlook integration in Salesforce to allow the syncing of contacts, events, tasks, and emails. These videos demonstrate the steps necessary to configure the outlook integration options, installing salesforce for outlook onto a workstation, and a walkthrough of how to sync records from outlook to Salesforce. This lesson covers the creation and management of workflow and approval processes that can reduce the number of clicks users take to accomplish their daily tasks. Administrators will learn all about creating new approval processes, the difference between actions and final actions, creating new workflow rules, email alerts, workflow tasks, and the benefits of using workflow field updates. This set of videos discusses the role of Cases and the various setup options for a customer or technical support team. Administrators will learn how to create and assign a console, create assignment and escalation rules, implement Solutions, create a case submission form via a web page or through email, setup entitlement management, install CTI integration and assign case teams. This lesson demonstrates and discusses setting up and the best practices for Salesforce Communities to allow customers and partners limited access to Salesforce data. After watching the videos in this lesson, administrators will be proficient in creating a new communities portal, configuring colors and branding, setting up new portal users, creating Knowledge articles, setting up Chatter, and implementing Ideas. This lesson explains the AppExchange and the various options it contains, such as electronic signature and email service apps. Administrators will know how to search for an app, install an app into their salesforce org, using that app and delegating licenses, as well as uninstalling an app no longer in use. Collaboration is a cornerstone of Salesforce functionality, touching everything from account and contact records to report conversations. Administrators will be able to setup Chatter, enable feed tracking on custom objects, setting up chatter groups, and take advantage of the free chatter licenses. This lesson explores the topic of mobile access and use in Salesforce. Administrators will become experts in the areas of configuring mobile navigation, configuring notification settings, enabling Salesforce1, as well as configuring Salesforce Classic for mobile devices as well. The videos in this lesson walk through the process of setting up security in Salesforce, which can be critical for larger organizations with multiple teams in different parts of the company. Administrators will know how to create roles and the role hierarchy, modify default sharing settings through rule creation, editing profiles, and configure session settings. This lesson explores the critical area of data management in Salesforce. Administrators are frequently tasked with importing and updating data in Salesforce production and the sandbox. These videos will provide hands-on examples of installing the data loader, exporting, importing, updating, deleting, and configuring data loader settings as well. 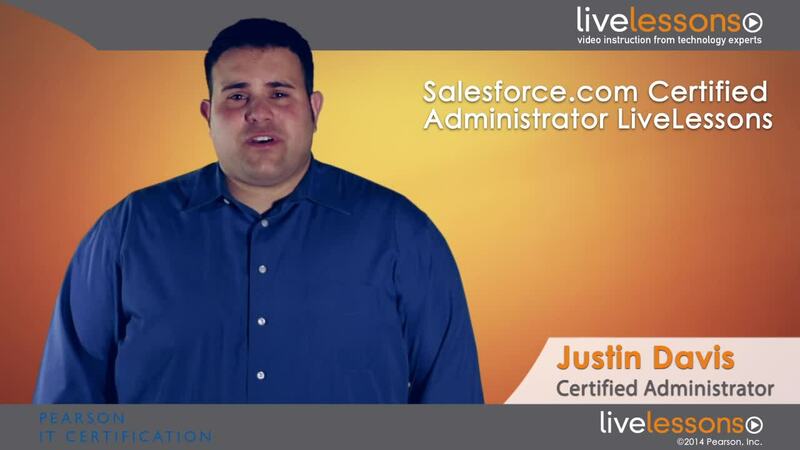 Salesforce.com Certified Administrator LiveLessons provides over 12 hours of live instruction to help you prepare for the Salesforce.com Certified Administrator exam. Hands-on video lessons detail the fundamentals necessary to perform every day tasks such as creating new fields, modifying reports, importing data, and managing users. Salesforce.com Certified Administrator LiveLessons contains 18 individual video lessons with over 12 hours of video training. The videos detail hands-on live instruction using Salesforce.com. Justin Davis walks you through each key objective for the Salesforce.com Certified Administrator exam while also providing real-world examples for using Salesforce.com so you can prepare for the test and learn how to administer within a Salesforce environment. Justin Davis is the chief operations officer of MK Partners, a full-service Salesforce consulting and implementation firm in Los Angeles. Developing on the Salesforce platform for more than five years, he has overseen 400+ Salesforce implementations for corporate, non-profit, and government clients throughout the United States. Justin is the author of Teach Yourself VISUALLY Salesforce.com.